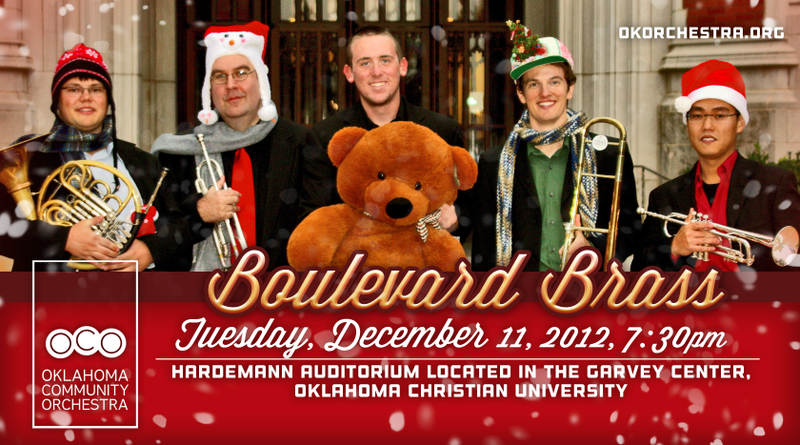 Boulevard Brass is a brass quintet based in Norman, Oklahoma that has earned a reputation as an exceptional chamber ensemble. Formed in the summer of 2011 by some of the top brass players at the University of Oklahoma, we have since given over a hundred performances throughout Oklahoma at a wide variety of venues, including church services, conferences, school assemblies, neighborhood parties, weddings, graduations, memorial services, museums, music festivals, and more! Boulevard Brass is dedicated to furthering the art of brass chamber music and expanding the brass quintet repertoire, with new arrangements and original pieces by our trumpet player and arranger Mervin Tay. In addition to standard brass quintet literature, we are compiling an extensive library of transcriptions and arrangements, covering all styles of music from historical Renaissance pieces to modern pop songs. We enjoy performing a wide variety of music, and we try not to take ourselves too seriously! One thing we are serious about is the next generation of musicians. We have enjoyed giving performances and clinics at schools throughout Oklahoma. We hope to inspire young players and encourage them to keep making music. We have been fortunate to have music be a big part of our lives, and we can tell you from experience that it just keeps getting more fun! Mervin is one of the founding members of Boulevard Brass, where many of his pieces are regularly performed. He has served as the music director and conductor for the OU Civic Orchestra and assistant music director to OU Symphony Orchestra and Opera. Mervin is currently the artistic and education director for Cimarron Opera in Norman, Oklahoma and the resident music director, conductor, and composer/arranger for the Sooner Theatre. In addition to performing, he is heavily invested in nurturing young musicians through production classes, lessons, masterclasses, and outreach performances for students of all ages. Apart from his commitments as a performer and educator, Mervin has also found a passion is writing and orchestrating music for various ensembles. His works have been performed by many organizations and universities, including the University of Oklahoma, Lyric Theatre Oklahoma, Cimarron Opera, Sooner Theatre, Poteet Theatre, the Norman Philharmonic, McFarlin Methodist Church and St. Luke’s United Methodist Church. His works have been performed at the International Trumpet Guild, National Trumpet Competition, and even the Sultan of Brunei’s 60th birthday. Mervin received Masters degrees from the University of Oklahoma in Trumpet Performance and Instrumental Conducting, studying with Dr. Karl Sievers and Dr. Jonathan Shames. Many of the works performed by Boulevard Brass were written or arranged by Mervin and can be purchased through Solitarius Press. Grant Wells is an active performer, composer, and educator. In addition to playing trumpet with Boulevard Brass, he plays keyboards in Banana Seat, an established cover band based in Oklahoma City. They perform weekly throughout Oklahoma and occasionally beyond at wedding receptions, casinos, private parties, and bars. Banana Seat plays popular dance music from the 70s through today. For more information about upcoming performances, see Banana Seat's facebook page. Grant also teaches at El Sistema Oklahoma, an after school music and mission program for youths in the Oklahoma City Public School District. Additionally, he maintains a private studio of students on a variety of instruments. Grant can also be heard weekly in the piano lounge at the Skirvin Hotel in OKC area. Logan hails from Lakeland, FL originally, but he has settled down in Edmond, OK. He works full-time for Edmond Music, a locally owned music store in the OKC metro area. On the weekends, he enjoys teaching brass lessons, making beer, and playing guitar and horn at the Edmond Campus of St. Luke’s United Methodist Church, where his wife Candace is the organist and director of traditional worship. Logan has a bachelor's degree in music performance from Florida State University and two masters degrees from the University of Oklahoma in Music Theory and Horn Performance. Daryl graduated in 2011 from the University of Oklahoma, where he studied trombone performance with Dr. Irvin Wagner and performed in jazz groups under the direction of Jay Wilkinson. Shortly after graduating, he became a member of Banana Seat, an established cover band based in Oklahoma City. They perform weekly throughout Oklahoma and occasionally beyond at wedding receptions, casinos, private parties, and bars. Banana Seat plays popular dance music from the 70s through today, featuring a 4 piece horn section. For more information about upcoming performances, see Banana Seat's facebook page. Daryl also performs in a 7 piece brass band called the Boyd Street Brass, which is modeled after New Orleans street bands. Led by Jay Wilkinson, they perform a mix of instrumental music and vocal tunes featuring Jay, who writes all the music performed by the group. Boyd Street Brass performs mostly original music by Jay, but they also have many arrangements of popular songs. They completed their first album in April 2015, and they will be recording their second album soon. More information about the album and upcoming performances can be found on their website, boydstreetbrass.com. David has a bachelor’s degree in Instrumental Music Education from the University of Oklahoma, a master’s degree in Euphonium Performance from the University of Oklahoma, and another master’s degree in Tuba Performance from Oklahoma City University. He has been a public school band director in the Oklahoma City metro area in the Putnam City and Edmond School Districts. Currently, he serves as Brass Lead Teaching Artist at El Sistema Oklahoma, an after school music and mission program for youths in the Oklahoma City Public School District. Additionally, he maintains a private studio of 12-15 students throughout the OKC metro area. As a performer, David has garnered numerous awards and recognitions on his original instrument, the euphonium, as well as his new one, the tuba. These include winning multiple International Tuba Euphonium Association regional solo competitions and excerpt competitions, being a semi-finalist in the Leonard Falcone Tuba Euphonium Competition, and being a finalist for the U.S. Army Band “Pershing’s Own” Ceremonial Band. David is also the solo euphonium for the Frontier Brass Band of Oklahoma, a group made up of local professional musicians from all around Oklahoma. He has been a featured soloist with many groups, including the Edmond Memorial High School Band, the PC North High School Orchestra, the University of Oklahoma Wind Ensemble, the Garden City, KS Municipal Band and the Frontier Brass Band of Oklahoma. Hit the play button near the top of the page to listen to samples in a variety of styles. You can continue to browse the site while you listen. Many of these snippets are from arrangements by our own Mervin Tay! The Boulevard Brass Quintet has an extensive repertoire in a variety of styles. Below is a sampling of our repertoire, sorted by genre. Many of our pieces are arranged specifically for our quintet by our trumpet player and arranger Mervin Tay - these pieces are marked below with an asterisk (*). Many of Mervin's arrangements and original pieces are available in the Boulevard Brass Chamber Music Series from Solitarius Press. To view the full catalog and order online, visit solitariuspress.com. We are happy to learn new pieces that you would like us to perform, and with sufficient notice we can also collaborate to add brass parts to existing literature that you would like to perform or even write original arrangements for just about any song that you would like to hear. We are also happy to assist you in putting together a program for your events. Just because your event isn't listed here doesn't mean we can't play for it! We would love to add to this list! We typically perform as a standard brass quintet, but we also perform regularly as a brass quartet at church events and with drumset for jazz events. The Boulevard Brass Quintet is also available for private lessons and group instruction. We can work individually with students, coach chamber ensembles, or even give combined concert and masterclass style seminars in the class room. We are happy to work with players of any level. There are a lot of factors in price, including distance of travel, rehearsal and performance length, and amount of preparation required. Please contact us if you would like a quote. We are performing from 12:00pm - 1:00pm in the Plaza District in OKC. This performance is part of the Art Moves concert series, hosted by the Arts Council of OKC. Check back later for more location details. We performed from noon - 1pm at the Holiday Pop-Up Shops in downtown OKC. We played for the grand opening of the new street car in downtown OKC. We performed Christmas music for a private event at the ballroom of the Cowboy & Western Heritage Museum. We performed an hour and a half of Christmas music for the annual Christmas party at Commonplace Books. We performed at the downtown OKC library as part of their Noon Tunes series, which features local musicians every Thursday in the main atrium. We performed prelude and ceremony music for the wedding of Brian Dailey and Olivia Biddick. We performed a short concert for students of El Sistema Oklahoma at their end-of-year celebration. We are performing at the state capitol during the demonstrations at the capitol building. This performance was part of the Art Moves concert series hosted by the Arts Council of OKC. We performed for students at Western Heights High School and Middle School. We performed for students at Edmond Sequoyah Middle School. We performed for music majors at Oklahoma Baptist University. We performed for students at Chandler High School. We performed for the morning service and both evening services at St. Luke's United Methodist Church's Edmond campus. We performed for the 8:30am and 10:50am services at St. Luke's United Methodist Church in downtown OKC. We performed an hour of Christmas music for the 1 year anniversary / Christmas party at Commonplace Books in OKC. We performed at the Edmond Campus of St. Luke's United Methodist Church. We performed for students at Norman High School. We performed an hour of Christmas music near the Holiday Pop-Up Shops in downtown OKC. This concert was part of the Art Moves concert series, which is hosted by the Arts Council of OKC. We performed for Reformation Sunday at Lord of Life Lutheran Church in Edmond. We performed in front of Civic Center Music Hall as part of the Art Moves concert series, which is hosted by the Arts Council of OKC. We performed at the Shawnee Library. This concert was our final performance in our tour of the Pioneer Library System for their summer programming. We had a blast performing at libraries all throughout the metro. Hopefully we'll do this tour again sometime down the road. We performed at the Edmond campus of St. Luke's United Methodist Church for their patriotic Sunday. We performed at the South OKC Library. This concert was part of a tour of performances in the Pioneer Library System for their summer programming. We performed at the McLoud Library. This concert was part of a tour of performances in the Pioneer Library System for their summer programming. We performed a 2 hour show at Moore Central Park Amphitheater. This concert was part of the Summer Nights Concert series as well as the Pioneer Library System's summer programming. We performed at the Noble Library. This concert was part of a tour of performances in the Pioneer Library System for their summer programming. We performed at the Newcastle Library. This concert was part of a tour of performances in the Pioneer Library System for their summer programming. We performed at Lions Park before an outdoor movie showing. This concert was on behalf of the Norman Central Library as part of the Pioneer Library System's summer programming. We performed at the Blanchard Library. This concert was part of a tour of performances in the Pioneer Library System for their summer programming. We performed at the Tecumseh Library. This concert was part of a tour of performances in the Pioneer Library System for their summer programming. We performed at the Purcell Library. This concert was part of a tour of performances in the Pioneer Library System for their summer programming. We performed at the Norman West Library. This concert was part of a tour of performances in the Pioneer Library System for their summer programming. We performed at Whole Foods Market in OKC as part of the Art Moves concert series hosted by the Arts Council of OKC. We performed for students at Highland West Jr. High for their career day. We performed for students at Belle Isle Middle School. We performed for Easter services at St. Luke's United Methodist Church's Edmond campus. We performed an hour of new orleans music for the 10th annual People Pleaser Party at the Skirvin hotel in OKC. We performed at the downtown OKC metropolitan library as part of their Noon Tunes series. Noon Tunes is a free concert series featuring local musicians every Thursday in the main atrium of the library. We performed a recital at the Goddard Center for Visual and Performing Arts in Ardmore, in conjunction with an art opening for Oklahoma artist Bert Seabourn in the Goddard art gallery. We performed for the 10:30am Christmas service at St. Luke's United Methodist (Edmond campus). We performed for the 6:00pm and 8:00pm Christmas Eve services at the Edmond campus of St. Luke's United Methodist Church. We performed for the 4:30pm Christmas Eve service at the Asbury campus of St. Luke's United Methodist Church. We performed for the 1pm Christmas Eve service at the downtown campus of St. Luke's United Methodist Church. We performed for both traditional services at St. Luke's United Methodist (downtown campus). We also played Christmas music in the Narthex between services. We performed for the Reformation Sunday service at Lord of Life Lutheran Church in Edmond. We performed for the Edmond campus of St. Luke's United Church for their first service in their new building. We performed for the morning service at St. Luke's Asbury United Methodist Church. This service was part of the sermon series "St. Luke's on Broadway". This week's show was Mary Poppins, so we performed three pieces from Mary Poppins, arranged by our own Mervin Tay. We performed for students at Guthrie High School. We performed at Leadership Square in OKC as part of the Art Moves concert series hosted by the Arts Council of OKC. We performed for both traditional services at St. Luke's United Methodist Church (at the main OKC campus). We performed for the wedding of Mack Burke and Olivia Buthod. We performed an hour concert for Shawnee Public Library's Summer Reading Kickoff concert at Celebration of Life Park. We performed for students at Piedmont Intermediate School. We performed for an hour at Penn Square Mall in OKC as part of the Art Moves concert series. We also performed for the 6:30 Christmas Eve service at the St. Luke's United Methodist Edmond campus. We performed for the 4:30 Christmas Eve service at the St. Luke's United Methodist Asbury Campus. We performed for both traditional services (and in between services in the Narthex) at St. Luke's United Methodist in downtown OKC. We performed 30 minutes of Christmas prelude music, ceremony music, and recessional music for the fall convocation of OU's Price College of Business. We performed for high school and junior high in Guthrie. We performed an hour of Christmas music in the lobby of the Chase Tower in downtown OKC as part of the Art Moves concert series. We performed for the morning service at St Luke's Asbury in south OKC, featuring Christmas music. We performed for high school and middle school students at Deer Creek High School in Edmond. We did 3 performances at Shawnee High School and Shawnee Middle School for their career day. We played a late night show at the Deli in Norman featuring a lot of polka music for Oktoberfest. We performed at the showcase for the Pioneer Library System summer programs. If selected, we will do a performance tour through all Pioneer Library System locations in Summer 2016. We performed for an hour at the Sandridge Energy Pavillion in OKC as part of the Art Moves concert series. We performed at Blanchard First United Methodist Church in Blanchard. We performed at St. Luke's Asbury United Methodist Church in Oklahoma City. St. Luke's had a sermon series called St. Luke's on Broadway featuring music from various Broadway shows. This Sunday's show was Oklahoma, so we performed selections from the musical, arranged by our own Mervin Tay. We performed at the Myriad Gardens Pavillion as part of the Art Moves concert series. We performed 30 minutes of prelude music, ceremony music, and recessional music for the Spring convocation of OU's Price College of Business. We performed for the 30th anniversary service at Lord of Life Lutheran Church in Oklahoma City. We performed for the morning service at St. Luke's Asbury United Methodist Church in Oklahoma City. We performed an hour of Christmas music at the Chase Tower in OKC as part of the Art Moves concert series. We performed for the Republic Bank of America Christmas Dinner. We performed prelude, ceremony, and postlude music for OU's Price College of Business fall convocation. We performed an hour of Christmas music at a Christmas Party for the Checotah Public Library. 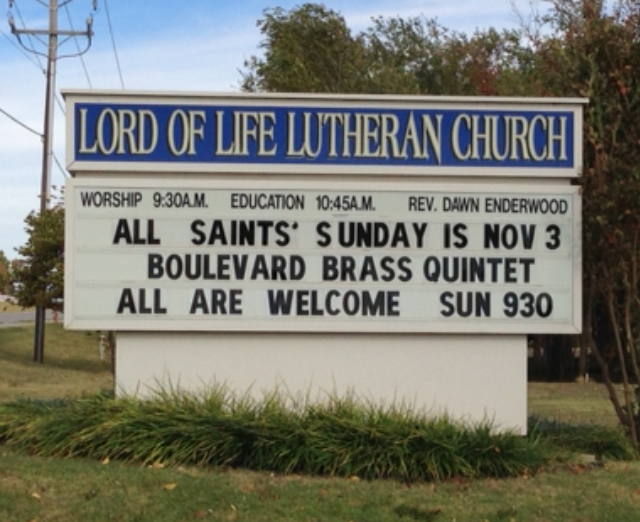 We performed reformation Sunday at Lord of Life Lutheran Church in Oklahoma City. We performed at the First National Center in downtown OKC as part of the Art Moves concert series. We were selected to audition at a showcase in Stillwater. Performers are heard by librarians from all around Oklahoma and offered the chance to play educational programs at libraries in summer 2015. We performed for the wedding of Jackie Price and Tim Birnbaum at the Philbrook Museum in Tulsa. We performed 30 minutes of prelude music, ceremony music, and an hour of fun music for the cocktail hour. Our own Logan Fish got married! We performed ceremony music for his wedding. We performed for a special farewell service for the minister Warren Jensen at United Church of Christ in Norman. We performed for the homecoming services at St. John's Episcopal church in Norman. We performed for the spring convocation of the University of Oklahoma's College of Business. We played 30 minutes of prelude music as well as ceremony music and a brief postlude. We were invited to perform for the 125th anniversary of St. Luke's United Methodist Church in Oklahoma City. We performed again at the Oklahoma Arts Festival on behalf of Art Moves on Saturday, April 26th from 3:00pm - 4:45pm. We performed on the Cafe Stage before and after the opening ceremonies of the 2014 Oklahoma Arts Festival. We are playing again this Saturday! We performed for Easter morning services at Lord of Life Lutheran church in Oklahoma City. We performed for the 45th annual Festival of Spirituals, hosted by the Cimarron Opera Company and First Presbyterian Church in Norman. We played both morning traditional services at St. Luke's United Methodist Church in Oklahoma City. We also played Christmas music in the lobby for 40 minutes between services! We performed Christmas music for an hour in the lobby of the Chase Tower in downtown OKC as part of the Art Moves concert series. We performed our first ever recital at Crossings Community Church. The concert was around an hour long and featured a variety of musical styles. We performed 30 minutes of prelude music, ceremony music, and a couple pep tunes for the OU Price College of Business convocation. We were invited back to perform at the governor's Christmas tree lighting event at the state capitol. We performed 45 minutes of Christmas music in the rotunda. We performed prelude and ceremony music for the wedding of Chris Hall and Kathy Gaither. We were invited back to perform at the Veteran's Day Assembly at Trumann Elementary in Norman. It's always a nice program and we were happy to be a part. We performed for several band classes at Whittier Middle School. We performed for the morning service at Lord of Life Lutheran church in Edmond. We performed for the first fall meeting of the Norman Lions Club at First Presbyterian Church in Norman. We performed for the fall kick off service at Westminster Presbyterian in Oklahoma City. We performed with choir and organ in addition to 30 minutes of prelude music. We performed in both traditional services at St. Luke's United Methodist in Oklahoma City. We performed the prelude, offertory, and postlude in addition to the hymns. We performed at the South OKC Library as part of a series of educational performances throughout the Pioneer Library System. We performed at the Shawnee public library as part of a series of educational performances throughout the Pioneer Library System. We performed at the Tecumseh Public Library as part of a series of educational performances throughout the Pioneer Library System. 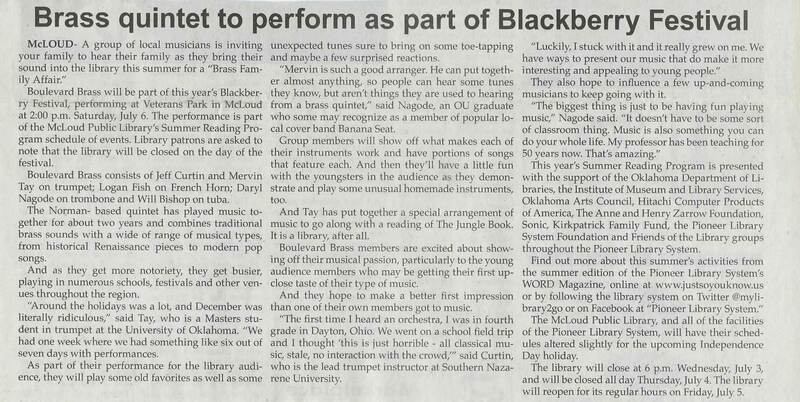 We performed outdoors at the 2013 McLoud Blackberry Festival. We performed outdoors before a community fireworks show in the park adjacent to the Newcastle Library. We performed at the Blanchard public library as part of a series of educational performances throughout the Pioneer Library System. We performed prelude and service music for the wedding of Jon Annesley and Julianne Janeway. We performed at the Moore public library as part of a series of educational performances throughout the Pioneer Library System. We performed at the Noble public library as part of a series of educational performances throughout the Pioneer Library System. We performed at the Purcell public library as part of a series of educational performances throughout the Pioneer Library System. We performed at the Norman public library as part of a series of educational performances throughout the Pioneer Library System. We were selected to perform as extras in a film being shot in Oklahoma. The film is called Rudderless, directed by William H. Macy. For more about the movie, check out their facebook page. We performed for the University of Oklahoma's College of Business graduation. In addition to the ceremonial music, we performed before and after the event as people file in and out. We performed again at the arts festival at 1pm on the Art Moves stage. We performed for the music programs at Strothers High School. We performed at the Festival of the Arts from noon - 1pm on the cafe stage. We performed for both traditional services (8:30am and 10:50am) at St. Luke's United Methodist Church in downtown Oklahoma City. We performed 4 pieces on Mervin Tay's final Masters trumpet recital. We performed at the Downtown Metropolitan Library in OKC as a part of the Noon Tunes series. We were happy to participate in the 44th Annual Festival of Spirituals, hosted by Cimarron Opera Company and First Presbyterian Church in Norman. We performed 2 pieces by ourselves and a piece with the combined choirs, which were all arranged by Mervin. We were invited back to St. Luke's United Methodist church in downtown OKC to perform the music for both traditional services. We performed a 7 movement piece composed by Anne-Valerie Brittan for her doctoral composition recital Saturday March 9th at 6pm. We played at Leadership Square in Oklahoma City for Art Moves. We performed from noon - 1:00pm near the waterfall in the main open atrium. We played from 6:30pm - 8:30pm at the Fred Jones Jr. Museum of Art on the OU campus. We played both services at St. Luke's United Methodist Church in Oklahoma City. We performed from noon to 1pm in the lobby of the Chase Tower in Oklahoma City for Art Moves. We played some traditional American jazz and pop favorites for a themed new years party at Spanish Cove. We were also joined by a talented guest drummer, Willie Peterson Jr.
We played for the 10pm Christmas Eve service at St. Augustine of Cantebury Episcopal church in Oklahoma City. We played a Christmas Concert at the Northwest Metropolitan Library from 2:30pm - 3:30pm. We performed in both services at St. Luke's United Methodist church in Oklahoma City. The president of the Republic Bank of America, Chuck Thompson, hosted a Christmas dinner at the Embassy Suites Conference Center. We were happy to perform for many generous patrons of the arts. We performed prelude and ceremonial music for the OU College of Business Convocation. We performed from noon - 1:00pm at the Oklahoma City Museum of Art. We featured American jazz and pop standards from 1910-1960 in conjunction with the museum's exhibition 'American Moderns'. 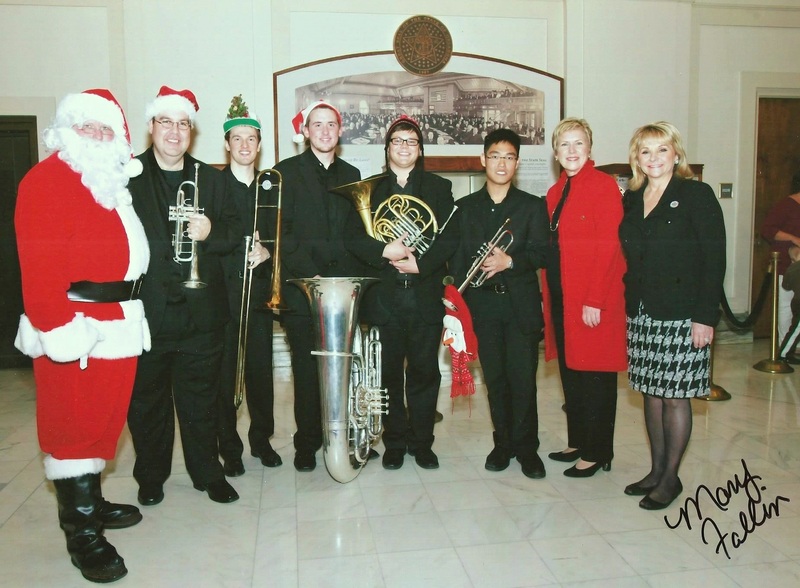 We were featured as guest artists with the Oklahoma Community Orchestra. We performed 2 pieces that combined the quintet and the orchestra in addition to 3 pieces that featured the quintet alone. 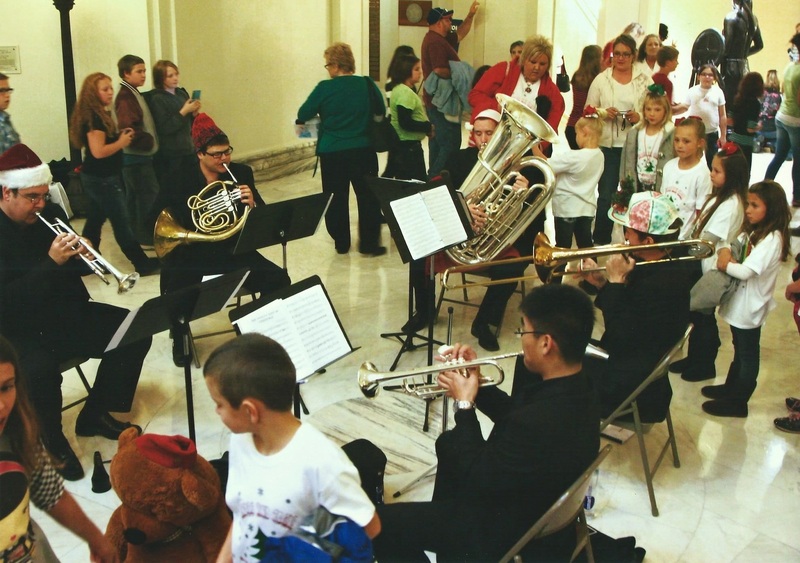 We played Christmas tunes for the annual tree lighting at the state capitol. We played at the annual Veteran's Day Assembly at Truman Elementary. They always put on a great program to honor our finest. We were happy to be a part! We performed from 7-9 at Pepe Delgado's Restaurant on Campus Corner. We provided prelude and postlude music for an OU Law School Convocation. We were invited to perform at the South Central Jurisdictional Conference of the United Methodist Church, held at St. Luke's United Methodist Church in OKC at 10am July 21st. After performing in the church services on July 1, our group was requested by a family member to perform at D.B. Rooker III's memorial service. We were invited to perform at Westminster Presbyterian church in Oklahoma City. We provided ceremonial music and entertainment for the OU College of Business Convocation in the Lloyd Noble Center. We performed an hour long concert at Spanish Cove Retirement Village Friday, May 4th at 7:00pm. We were one of the chamber groups representing the OU School of Music at the Norman Music Festival. We performed a brief set near Benvenuti's Restaurant. We performed at the spring composers recital at 6:00pm Sunday, April 15th in Pittman Recital Hall. We performed 3 movement pieces by composers David Ikard and Wes Stephens. We performed Friday, April 13th from 4:30 - 6:30 for the Faculty Connections Reception in the Sandy Bell Gallery of the Fred Jones Junior Museum of Art. We performed for a reception for researchers and faculty at the Stephenson Research & Technology Center Atrium. We participated in the 42nd annual Festival of Spirituals, hosted by the Cimarron Opera Company. The festival is a non-profit event that features a combination of local churches and professional singers from the company working together to perform a variety of spiritual songs. We were glad to be a part of a great tradition. We performed at Mid-American Christian University's chapel service. The service was dedicated to celebrating the history of church music - we performed several arrangements of traditional hymns with the chapel choir and the congregation. We performed 3 pieces to conclude Logan's Masters Horn recital. We performed original arrangements of Yesterday (The Beatles), Jeanie with the Light Brown Hair (Stephen Foster), and an original salsa-inspired piece by Mervin called Salsosa! We performed in the Fred Jones Jr. Museum of Art from 6:30 - 8:30 as part of the Norman Arts Council's "Art a la Carte" series. The art museum teams up once a month with the arts council to provide free museum attendance featuring live music by local artists. The president of the Republic Bank of America, Chuck Thompson, hosted a Christmas dinner at the Embassy Suites Conference Center. This dinner was attended by generous patrons of the arts in our area, including the president himself. What we do would not be possible without the generous support of patrons like Mr. Thompson. We performed at the Reynolds Performing Arts Center for OU's december convocation for the Fine Arts college. We were asked to perform at the wedding of Lynn and Lindsay Robertson. We provided all of the music for the prelude, wedding service, and reception. We were invited back to perform at the traditional service at St. Luke's. We performed the prelude, postlude, and offertory in addition to one piece with the choir. Truman Elementary has a special assembly every year to celebrate veteran's day. This year they had a Skype chat with family members of Truman students and other soldiers from Oklahoma who were serving in Afghanistan. We were asked to perform at the luncheon for the 2011 Oklahoma Creativity Forum. The event was held at the Embassy Suites conference center in Norman, and there were over 1000 people in attendance. We performed in the traditional service at St. Luke's. This performance featured several arrangements by our own Mervin Tay. We performed an original arrangement of his as well as 2 choral works adapted to include brass. We were asked to play at an annual neighborhood party in the vineyard. Other entertainment included the OU Mascots Boomer and Sooner. Mr. Tay worked personally with me to choose the perfect selections of music for my wedding. The quintet played brilliantly, and many of the guests commented on how the music was their favorite part of the ceremony. The members of the quintet were friendly, professional, accommodating, and easy to work with. I cannot recommend the Boulevard Brass Quintet highly enough! The concert was superb! The residents do not give standing ovations unless merited! I do hope you will consider us as a future venue as this was one of the most enjoyable concerts this year! I have had the pleasure of hearing the Boulevard Brass Quintet perform on several occasions, at several different venues. They always beautifully capture the essence of the program in which they are performing. Their versatility continues to amaze! 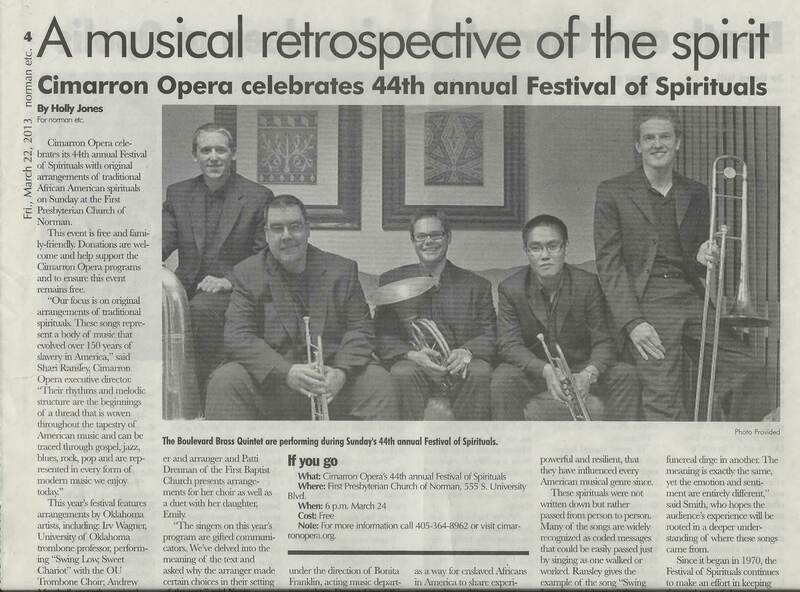 We at Cimarron Opera recently invited the quintet to perform at our annual Festival of Spirituals, in which Mervin Tay's arrangements and the quintet's interpretations were truly a highlight. ********, you guys sound great! I can't thank you guys enough for being a part of this. I hope you were privileged to hear the Boulevard Brass Quintet in worship on September 11th. They were outstanding! Your quintet is rock solid! I couldn't have been more pleased. You brought the feel and sound of NOLA / Mardi Gras to our event! Thank you all again for being a part of our evening. I heard SO many great comments about the music. Our team and leadership loved it! Thanks again - I've gotten a lot of nice comments about your quintet's participation and performance today! [You were] not only excellent musicians to perform at this event but also musicians who are professional and courteous with our Norman Public School students, staff, and patrons. This website was built by Daryl Nagode. If you notice any problems with the site, please don't hesitate to contact me! I occasionally do freelance website jobs, but I am currently too busy to take on any clients. Mervin Tay has composed and arranged a significant portion of the music the Boulevard Brass performs. Many of his arrangements and original pieces are now published through Solitarius Press. To view the full catalog and order online, visit solitariuspress.com. Thank you so much for performing at the Capitol for the Governor's Tree Lighting. You were amazing! Let's get you on the roster! We want to say a special thank you to Boulevard Brass Quintet for performing with us. You all were spectacular. We recently invited the quintet to perform at our annual Festival of Spirituals, in which Mervin Tay's arrangements and the quintet's interpretations were truly a highlight. Their versatility continues to amaze! Thank you so much for performing at the Governor's tree lighting ceremony this year. It is always a pleasure to hear BBQ perform. It wouldn't be the same without you guys! Thank you, thank you, thank you for playing at the Festival of Spirituals again this year! Your offerings take the program to a whole new level by adding a unique sound vehicle for the audience to hear this uniquely American art form. I love it and so do many others - there is always a great deal of positive feedback about Boulevard Brass.